Whether you're trimming a few hedges or removing a large tree from your yard, the proper chainsaw will help you get the job done right. Ace Hardware provides a wide collection of gas and electric chainsaws to choose from, making it easy to find the right tool at a price that works within your budget. Find out which chainsaw you need to maintain your landscape with help from Ace. Gas powered chainsaws are a great option for the avid landscaper. When you are setting out for tackling large, all-day landscaping projects, this tool can keep up. Since it is powered by gas, it can easily be filled and used for a full day's work. Ace Hardware offers a wide selection of gas chainsaws from which to choose, including different bar lengths to help you take on projects of any size. There's no need to keep a bottle of gas on hand with these electric models – simply plug them into an extension cord or charge the battery packs and go to work. From standard chainsaws to pole models, Ace offers the perfect chainsaw for specific yard work and projects. Proper maintenance of your chainsaw will ensure it stays in quality condition for several projects for come. Buy replacement chains to give new life to your equipment once the existing saw becomes dull. Chainsaw files, grinding stones, falling wedges, screnches, and sharpening stones can extend the life of your chainsaw and ensure it operates at its best. Stock up on backup accessories to make sure you have everything you need to complete long weekend projects. That way, your to-do list doesn't have to stop just because your tool needs new parts. Chainsaws are an essential tool for every homeowner. Find out the several ways you can use this outdoor equipment to get all your yard work done with ease. Keep your hedges perfectly trimmed. Remove unwanted plants from your yard. Trim low-hanging branches or cut excess limbs from trees. Prune any plants and bushes. 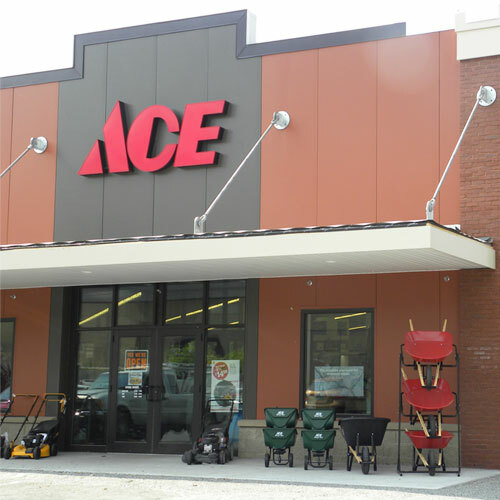 Stop by Ace Hardware today to find the right chainsaw and other yard tools for your next home renovation project.